What is it you expect from life? Are you seeing life through the lens of what society, the media and even your own friends and family tell you? If you are expecting anything from life—especially what other sources tell you to expect—then you are sure to be let down. Not because you don’t deserve greatness but because we cannot possibly fathom the abundant riches that each present moment life has to offer. On the contrary, if you want to follow the footsteps of affluent people and if you’re expecting anything less than greatness at least start here: start expecting greatness—then from there, open your mind so big that even your own expectations mystify you. Let life’s possibilities be so unlimited that every moment of your life comes to you with surprise and wonder. In this way, we turn our limited expectations into a surprise of what infinite ways that life will nourish us. 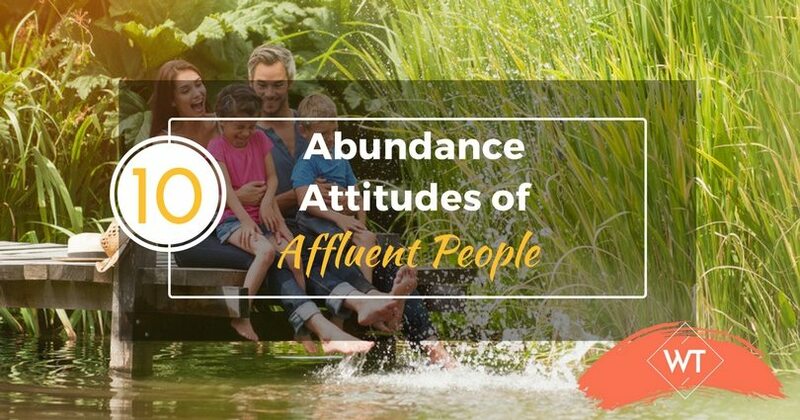 At the core of a truly abundant life are certain attitudes. Without the right attitudes we do not have the right ideas about life and go on wondering how life falls short of expectation. Abundance is a reality; in fact, it is the ultimate reality. If we want to end our limited thinking and expand the game of life we would be wise to start with a shift in our attitudes. An attitude of abundance would certainly change the abundance equation in our life. To believe and to know is two different things. Many people advise believing that anything is possible. However, to believe is to stay in not knowing; hence the difficulty in maintaining positive beliefs. Instead of blind belief, take a look at the facts. Nature is a prime example of the endless possibilities of life. A single tree is capable of producing hundreds of fruit, each containing hundreds of seeds that can produce hundreds of more trees all across the world. There is no such thing as impossible according to a tree, life expands and blossoms in an endless amount of ways. And at the source, the life force contained in each seed is absolute authority, affluent and abundant. There is no room for settling when it comes to living a truly abundant life, why would there be? Life is inexhaustible; we cannot use up what is infinite. Having an attitude of always striving for the “best of the best” is one of the many strong attitudes of affluent people. This is not to be ungrateful for what we have, but rather, knowing and owning our highest potentials. Too often people settle for poor quality food and low-case experiences—what I call the Dollar Store Syndrome—consuming at a lower level, yet in excess—out of fear of having the best. Be grateful for what you have and make the most of it. Treat every part of life as if it was the best of the best, because it is. A billion dollars in the bank without a sense of carefreeness is still a state of poverty. Despite what many think, not all people with riches are wealthy. Riches do not guarantee wealth. It is very possible to have billions of dollars and feel out of control when it comes to money. True wealth and abundance stem from carefreeness—to be content and happy regardless of the dollar amount. Someone who is truly affluent can have or not have money and remain calm and serene. With carefreeness comes charity and the ability to share and give. Most everyone has experienced the state of wealth that comes with giving without expectation. When we give with no attachment to receiving, we are experiencing true affluence. If you have yet to experience this, commit to giving without the need to receiving anything in return. This doesn’t mean to refuse receiving, that stops the flow of abundance, but relinquish the need to receive something back. Paying forward is a great way to practice carefreeness. With an attitude of abundance, there is no such thing as failure. Surely there is the whole reality of not achieving an expected outcome for a certain goal. However, true abundance doesn’t call for such obsessive goal setting. Instead, the goals and missions that stem from our true, infinite potential are accomplished effortlessly and with ease. Does a tree struggle to grow? Does the rain suffer as it falls? The rainiest of days are a blessing to the abundant individual. The so-called challenges in life are opportunities to see what’s truly needed in life, not what our minds neurotically crave. Adapting an alchemist attitude is as simple as asking “what’s the opportunity here?” in the midst of what is commonly mistaken for a problem. An alchemist mindset turns failure into opportunity. There is a great difference between wealth and riches. Riches are material abundance; which can be acquired even through unethical means. Wealth is a state of being; it is an attitude of gratefulness. Without gratitude for what is, we can never be satisfied with what will be. Nothing will be good enough if right now isn’t. With a grateful heart comes a similar attitude of generosity to others. When we are grateful, we need nothing and therefore give the greatest gift of all, love. Instead, an attitude of abundance requires true happiness, the ability to be happy without reason; to happily achieve, not achieve happiness. The more attitude-centered we become, the more we develop an abundance mentality and the more we are genuinely happy for the successes, well-being, achievements, recognition, and good fortune of other people. When we become truly happy for ourselves we become more humane, seeing others’ success and happiness adds to our lives. Truly affluent people are focused on what’s important and honest about their goals. In simpler words, they have clear intentions. There are no hidden intentions, such as seeking fame to feel significant or to have power over others. An attitude of focus means getting clear on what we truly want and then expressing that to others and all of humanity. When we have clear intentions things come to us effortlessly, we attract opportunity and the right type of people into our lives. Abundant individuals are inspiring because they live in good spirits. Affluent people love what they do and have a zest for life that touches others. You do not need to be the richest, the prettiest or the smartest to be inspiring or motivational. The most inspiring people are the most authentic people—those who accept and embrace their uniqueness to the fullest. What little weird things about you do you keep to yourself? Share it with the world. If you look at some of the world’s more famous and elite, they all inspire us because of they share the things about themselves that most of us keep hidden. Inspire the world with what you know and who you are, not who you think you should be. When we are in tune with our purpose in life, we recognize the pure potential of our ability to serve. We are each individuals with individual life purposes and each purpose has a very unique demand. Step into your place of power by creating and foreseeing the demand of your unique skills, talents and passions. Many are unfulfilled at work or in life because they are living according to a set of “have tos” provided by others. When we “have to” we are not “free to.” Doing things with purpose makes life abundant because we give from a place of abundance. When we do things we do not love, we become resentful and fragment our potential. However, when we live each moment with purpose, we reach from a place of endless love and joy and give it to all that we do, and all that we serve. Not many feel comfortable with receiving. Yet it is as necessary as giving. They go hand in hand; two sides of the same coin. They are the cycle of life. To graciously receive is an expression of the majesty of giving. That is because to receive is to be at effect of your own cause. We receive back what we put out. If we feel uncomfortable receiving it is because we don’t feel comfortable in the dignity of our own giving. This is not an attitude for an affluent individual. 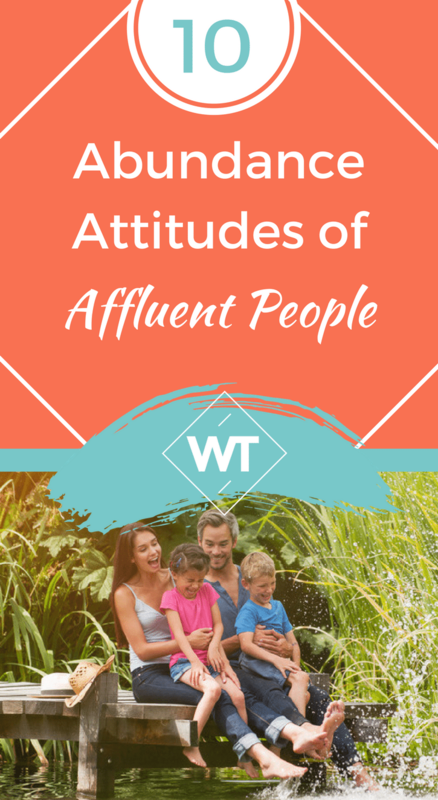 Truly affluent people know that they are, others are and that’s all there is. We are all infinite beings with the ability to give the best and in effect, receive the best. In my experience, there is no need to forcefully apply these attitudes. Force usually makes things more difficult to do. Using effort to cultivate a mood only creates strain and stress by resisting what already is. It is enough to know of these attitudes and become aware of them as they arise throughout your daily life. Results will not occur over night. As you metabolize this new information, over time you will start to see how these attitudes are universal truths are engrained into the fabric of existence. For assistance, write these attitudes down and review them daily—or read this article daily—reminding yourself of them will be enough to bring them into practice, life will provide the circumstances. If you wish to have a truly abundant life and live like the affluent people, then start with the way you view life. Adapting these attitudes as your own is like adapting the attitudes of God, if there was such a thing. See your life through the eyes of infinite possibility and you will see possibility in everything.